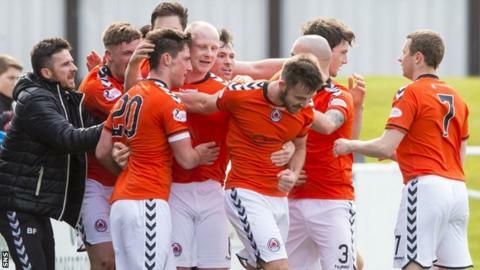 Barry Ferguson's Clyde took another step towards promotion to Scottish League One with victory over Elgin City in the play-off second leg. A brilliant Jordan Fitzpatrick free-kick midway through the second half all but settled the contest, with Clyde 3-1 ahead before travelling north. And Scott Linton sealed it right on full-time when he dinked the ball home. Clyde now face Queen's Park, with the first leg at Broadwood as it is unavailable for the second leg. Stevie Ross should perhaps have put Elgin ahead when clean in on goal, but his powerful drive was tipped brilliantly behind by John Gibson. Clyde had a chance to go ahead before Fitzpartick's goal, with David Marsh, David Gormley and Jordan Kirkpatrick all going close after the break. Kyle Macleod did have a big shout for a penalty for the home side early on when he appeared to be barged on the edge of the box, but that wasn't given by referee Euan Anderson. It was a very frustrating afternoon that rather petered out for Jim Weir's side. The visitors managed the game well and frustrated their hosts to few chances, with Linton finding the net at the end to deservedly progress. Clyde manager Barry Ferguson: "I wasn't pleased with the first half, but I thought we controlled the second half and thoroughly deserved our win. "Queen's Park are a good team with a lot of good players. "We played them two or three weeks ago and it was a pretty even game and they beat us by a goal, but it is a final and we have to wait and see who handles it on the day." Match ends, Elgin City 0, Clyde 2. Second Half ends, Elgin City 0, Clyde 2. Goal! Elgin City 0, Clyde 2. Scott Linton (Clyde) right footed shot from the centre of the box to the centre of the goal. Attempt blocked. Sean Higgins (Clyde) right footed shot from outside the box is blocked. Attempt saved. Jamie Watson (Clyde) right footed shot from outside the box is saved in the centre of the goal. Corner, Clyde. Conceded by Jamie Duff. Thomas Reilly (Elgin City) is shown the yellow card for a bad foul. Steven Brisbane (Clyde) wins a free kick in the defensive half. Chris Smith (Clyde) wins a free kick in the attacking half. Attempt missed. Jamie Watson (Clyde) left footed shot from outside the box is close, but misses to the left. Steven Brisbane (Clyde) wins a free kick on the left wing. Foul by Marc McKenzie (Elgin City). Attempt saved. Archie MacPhee (Elgin City) right footed shot from outside the box is saved in the centre of the goal. Sean Higgins (Clyde) is shown the yellow card for a bad foul. Substitution, Elgin City. Marc McKenzie replaces Craig Gunn. Substitution, Clyde. Jamie Watson replaces David Gormley. Corner, Elgin City. Conceded by Steven Brisbane. Substitution, Clyde. Sean Higgins replaces John Gemmell. Substitution, Elgin City. Connor McLaren replaces Daniel Moore. Goal! Elgin City 0, Clyde 1. Jordan Kirkpatrick (Clyde) from a free kick with a right footed shot to the top right corner.